"We live on a blue planet that circles around a ball of fire next to a moon that moves the sea, and you do not believe in miracles?" Seeing the mermaid tail blankets on Zaful gave me the idea of making a new wish list. Mermaids are mysterious creatures and they have always been an inspiration in fashion, too. Ariel is, I think, the most well-known mermaid nowadays. You probably know her from the 1989 Disney movie, "The Little Mermaid", but you might not know that the story is based on a fairy tale of the same name by Hans Christian Andersen which was first published in 1837. 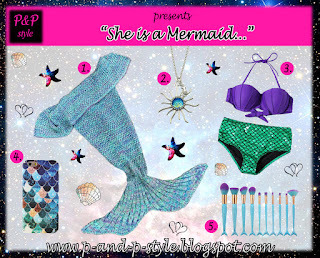 Inspired by this, I collected some mermaid themed items for you. Have you seen the movie, "The Little Mermaid"? Do you like mermaid inspired items? Which one from the picture above is your favourite? That mermaid blanket is the cutest! So nice and interesting post. It's so beautiful,like it,. I love this mermaid blanket ! I am so fascinated by mermaids, nice selection!